Reflexology is an ancient therapy designed to help restore and maintain the body into a healthful balance. It is based on the premise that particular areas of the feet (reflexes) correspond to organs, muscles, glands and parts of the body. 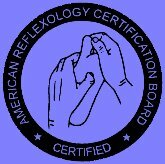 As a result of stimulating reflexes in the feet by applied pressure, messages are sent through the nervous system effecting the corresponding area and encouraging the body back into balance.